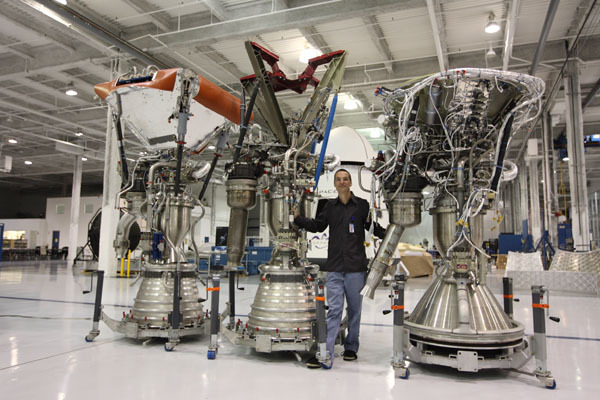 Tom Muelle rwith his Merlin engines as SpaceX headquarters (Credits: Roger Gilbertson/Tom Mueller). Have you ever had a hankering to understand exactly what’s going on in the midst of all those fireworks at a launch of SpaceX’s Falcon 9? Tom Mueller, SpaceX’s Vice President of Propulsion Development, obliges with this narrated schematic of the engine Mueller designed in his garage before being discovered by Elon Musk. Mueller became a founding employee of SpaceX and his Merlin rocket engine, elegant in its simplicity, is now the basis for all the company’s launch vehicles.